Fort Gratiot Township was organized as a township in the year 1866, with H. Stevens as the first Supervisor. 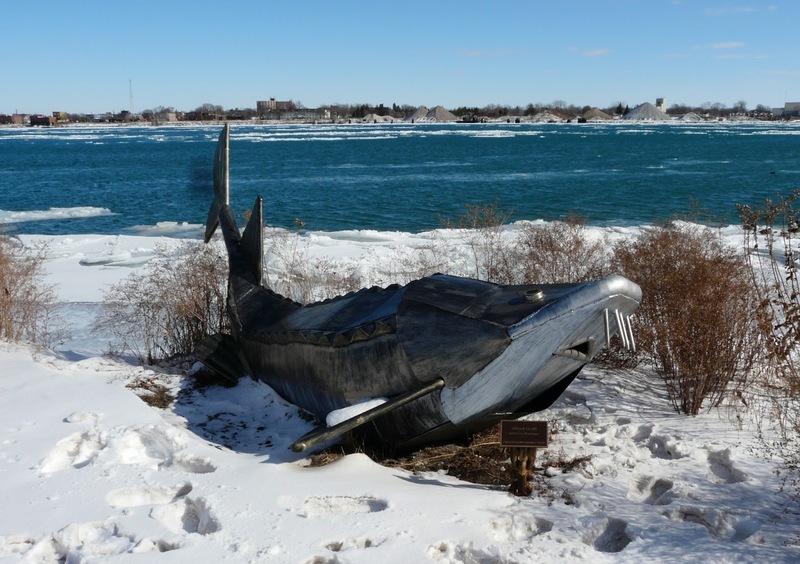 It is situated in the eastern part of the County, at the foot of Lake Huron. It is a fractional township, and is designated Town 7 north, Range 17 east; it is bounded on the north by Burtchville, east by Lake Huron and St. Clair River, south by the city of Port Huron and Port Huron Township, and west by Clyde Township. The surface of the country is mostly level, with some marsh land, and was originally timbered with pine and hemlock. The soil is of a sandy nature, producing wheat, oats, hay, potatoes, and corn. It is traversed by the Black River in the southwestern part. T. Lymburner is the present Supervisor; and the population numbers one thousand three hundred and sixty-one. Fort Gratiot, the principal village and post-office, is situated at the foot of Lake Huron, on the line of the Grand Trunk Railway, at the point where it crosses the St. Clair river, and contains a population of about eight hundred. It is one mile north of the city of Port Huron, and sixty-three from Detroit, and derives its name from the fort of that name which is located here, on the site of the old French trading-post [this had been disputed and is not supported by the 1989 archaeological study of Fort Gratiot by Bruce Hawkins and Richard Stamps]. It is of importance as being the point where the traffic of the Grand Trunk Railway crosses the river, and contains one Methodist Episcopal church, a union schoolhouse, stores, hotel, express-office, and telegraph-office, and was settled as early as 1817, although the trading-post was established here many years prior to that date. This place is also of some notoriety as being the distributing-point for large numbers of emigrants who come direct from Portland [Maine, apparently]. Portion of page 32 of the atlas, showing the Fort Gratiot area. 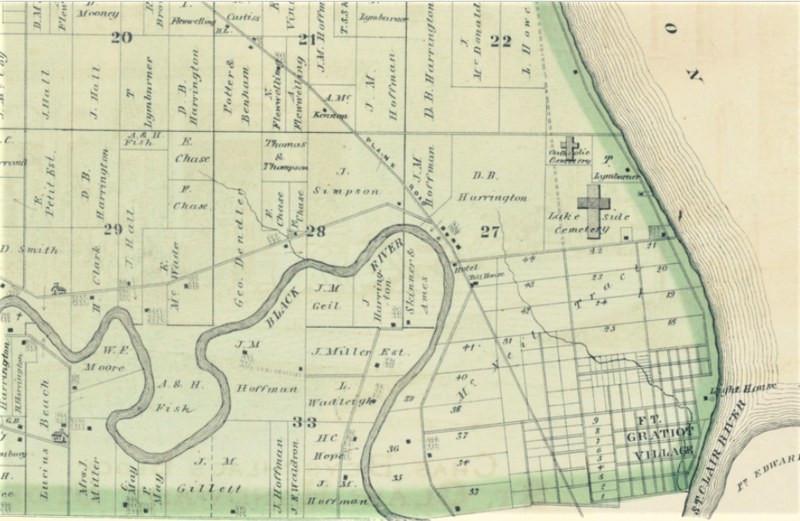 Port Huron Township was originally known as Desmond, and was organized in 1828 (with J. Herrington as the first Supervisor), although the area embraced within these limits was settled many years prior. It is reduced in size by the organization of other townships, and is fractional in its dimensions. The city of Port Huron, within the original limits, now forms a distinct organization. This township contains at present a population of one thousand and seven, and is designated Town 6 north, Range 17 east, and is bounded on the north by Fort Gratiot Township, east by the city of Port Huron and St. Clair River, south by St. Clair Township, and west by Kimball Township. Its proximity to the St. Clair River and city of Port Huron makes it desirable as a place of residence. This, like all the other portions of the County, was a timber region, in which pine, black ash, and hemlock abounded. The characteristic feature of the soil is sandy, with considerable marsh land, producing corn and oats. Among the pioneers of the township are Judge Z. W. Bunce, James M. Gill, B. Sturgis, S. Huling, A. F. Ashley, and James Young. Judge Bunce located on the same place where he now resides (five miles south of Port Huron) in 1817, and has been prominently identified with the interests of the County ever since his settlement here. The principal village post-office and shipping-point is Marysville (formerly Vicksburg), situated on the river St. Clair, in the extreme southeastern corner of the township, six miles south of Port Huron, and about the same distance from St. Clair. It contains a population of about three hundred, and is the headquarters of the Mills’ Transportation Company, which is an extensive corporation. Ship-building was formerly carried on at this point to a considerable extent, and it is a regular stopping-place for all river and lake boats, and has immediately in the village two large steam saw-mills, and two more closely by. There is also a Methodist Episcopal church, a union school-house, store, hotel, and telegraph-office in the village. The Chicago and Lake Huron Railroad, and the Grand Trunk Railway, both traverse the township, and the Black River touches the northeast corner. 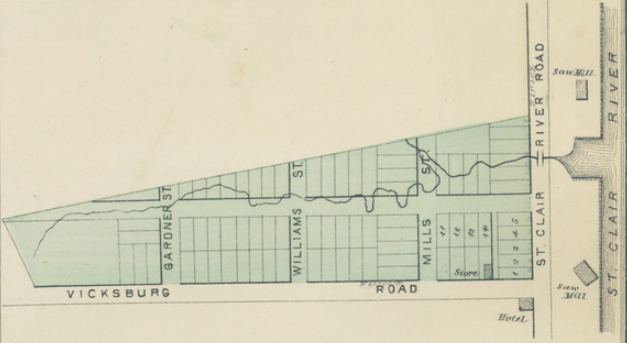 There are many interesting facts connected with the early settlement of this section that will be treated in the history of Port Huron. Portion of page 45 of the atlas, showing the layout of Vicksburg, now Marysville. This entry was posted in Fort Gratiot Township, History, Marysville, Michigan, Michigan history, Port Huron Township, St. Clair County and tagged Fort Gratiot Township, Great Lakes history, historical shipbuilding, Marysville, Port Huron Township, St. Clair County history, thumb area history by porthuronhistory. Bookmark the permalink.